As well as WHS having a back-up engine built in, it also has a lessor known feature to also help you protect your data, Volume Shadow Copy. Shadow Copy (also called VSC, Volume Snapshot Service or VSS) automatically creates point-in-time copies of files as you work, so you can quickly and easily retrieve versions of a file you may have accidentally deleted. 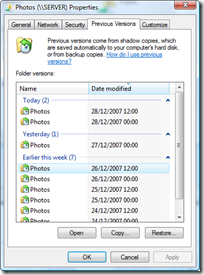 Shadow copy creates copies on a scheduled basis of files that have changed. Since only incremental changes are saved, minimal disk space is used for shadow copies. It works on single files as well as whole folders. When restoring a file, all previous versions that are different from the live copy on the disk are shown. 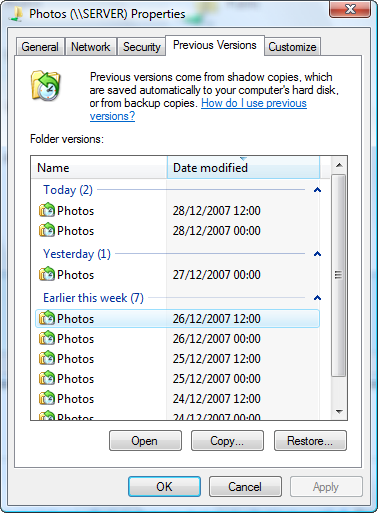 When accessing a previous version of a folder, users can browse the folder hierarchy as it was in a previous point in time. The VSS service takes a snapshot every 12 hours at noon and mid-night for all network shares. It’s normal for it to be set to disabled, but it does get run. The number of copies that will be kept is dependent on how much free space you have free, how many files have changed, and how big those files are. Lots of changes, or changes to big files, or little free space, all mean that few copies are kept. In your client, right click on the connector in your task, shared folders, then chose a folder, right click on it, properties, then “Previous Versions” tab. Not on HP. They seemed to have removed it. Everyone on the forums with HP doesnt have it and when i spoke to HP tech support, they said that there was nothing official but that it was “very likely” that the engineeres did remove it. My first negative on the HP MSS….. Shadow copy not working here, either…. Dang…..
How do I enable this for my native Vista/32 installation? WinXP Home? This is a great feature! Any information on how to configure its parameters? We Got Served had an article on how to enable it but it has now disappeared? So why did HP engineers disable WHS – Shadow Copy? What was the reason? By design, protection or some other issue? The issue is still being investigated. But at present MS recommend Not to turn it on as it can cause serious damage. So Phillip, what is the latest on VSS on WHS? Should I use it or not? (I am running OEM copy of WHS, not HP). At the present time I would leave it off. Has this bug been fixed yet? Can I turn on Shadow Copies? Hi Phillip, any update on this ? Does PP1 now fix these issues? I have a mediasmart 475. Can I use vss yet?